If you would like to make a booking, or require more information, please email us . We live in Karin, in Central Dalmatia, under the Velebit mountains and by the Karin sea. The village is small and situated in a naturally beautiful setting. There are miles of trail roads here in the hills which I have been exploring, along with the "official" TET (Trans Euro Trail) trail which passes by near us. I will have two sidecar outfits available for use. I will provide basic training if required for non sidecar riders, accomodation and food as well if required. I will lead the riders (and passengers if required) on a pleasant trail ride into the hills and mountains around this area near Zadar. The views are spectacular, so plenty of opportunity for some great photographs and enjoyable soft off road riding. I would provide full support in terms of punctures, etc. and be the guide. The trails we will be riding will be mostly gravel tracks, nothing too challenging. We will stop somewhere for lunch whilst out. Either taking a picnic or stopping at a konoba (restaurant) depending upon the route you choose. At the end of each day I'd guide you back to our village to your accommodation, where you could either choose to make you own arrangements for the evening or I can provide a meal in a local restaurant, or we could provide a traditional Croatian grill (BBQ). Each day would be different and there would be choices of trail based upon your own preferences, perhaps taking in part of the stunning coastal road, or a trip to one of the many islands. You can choose to take just one guided tour or as many as you like whilst you are here (so long as you book them in advance). We will be flexible, so if you don’t feel like riding one day, you can arrange to go the next day if that is suitable for us as well. I.E. You book to stay for 7 days, and book 3 sidecar tours on Monday, Tuesday and Friday. You can take 2 of those tours on Wednesday and Thursday instead. Fly into Zadar airport, where I would meet you and drive you to your accommodation which would be a self contained apartment. Proficient sidecar riders would also have use of a sidecar outfit independently outside of the tour times, to allow them to explore the area alone, on road use only and at my discretion based upon my observations of your riding. This is because sidecar riding is a slowly acquired skill and only proficient riders would be safe to progress by themselves. Use of sidecars out of tour times, will be decided and paid for whilst you are here. There is also the possibility to rent a Honda Grom 125 whilst you are here for exploring the area. If you have alternative ideas about how you want your holiday to be, let us know and we will do our best to arrange it your way. Our village has numerous bars and restaurants, small shops, a beautiful beach and of course the sea, with Zadar city only 30 minutes away. Krka national park is one hour away, where you can ride and walk around the stunning waterfalls. The coastal road is on our doorstep and is truly breathtaking, one of the best coastal roads in the world. I would tailor each tour to you, there is no fixed itinerary, so you can choose what type of day you want, how long etc. (with my suggestions of course, as a local guide). Motorcycle licence holders may hire the Grom from us if you are not proficient enough to ride an outfit unaccompanied, for use out of tour times (overnight). I cannot arrange unaccompanied sidecar hire until you have been assessed here by myself. If Brexit has occurred prior to your visit, you will need an IDP (International Driving Permit) as well as your UK license. Maximum 2 persons per sidecar. 2 sidecars available. 1 Honda Grom 125 available. You may also ride your own outfit if you are making the trip here by road. If you are part of a 3 person group, I can take one of you as passenger in my sidecar whilst you ride the other one with a passenger. As the year progresses I will be adding additional solo bikes so there may be 2 available when you arrive. Car hire is available without booking at Zadar airport. Should you prefer to have a car available for your stay. We will still meet you at the airport if you like. Karin has plenty of scope for non riding activities, walks by the sea or in the hills, the sea for swimming, beach for sunbathing, we have a small boat, fishing, etc. 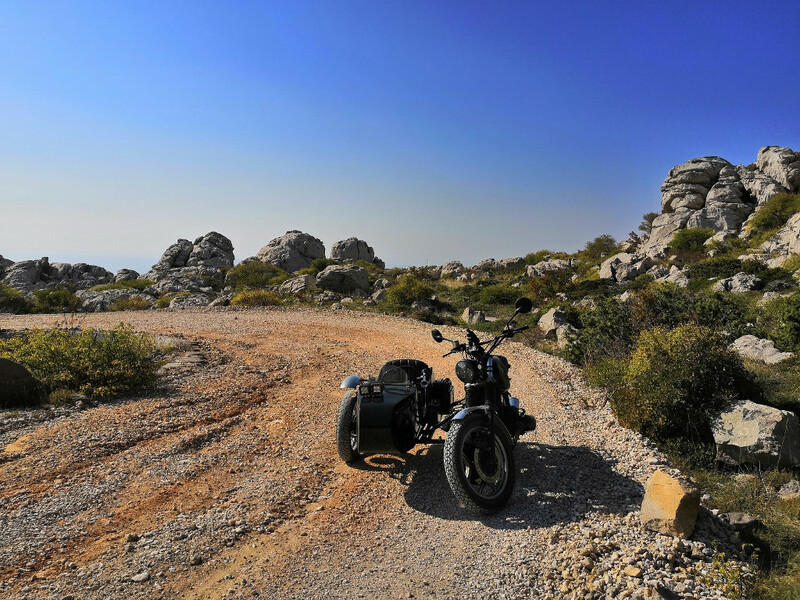 If you don't take the independent transport option (bike or sidecar) we can take you to Zadar city or Krka etc. with the sidecars, or by car for a day out if you like. Nearby towns such as Novigrad, Posedarje and many others offer different views, interest and food choices. Premium restaurants can be recommended for foodies! In the summer months there is a small amusement fair for children on the beach. Quiet beach areas are only a short walk away. Our town is only busy with tourists in July and August. The climate here is superb, very dry and warm from April to October. June, July and August are very hot, temperatures can reach 45 degrees in the day, though 38 to 40 is normal. Be prepared for the heat. April and October are warm, around 25 degrees but the Bura (a strong wind) can blow some days and there may be a little rain on some days. Up in the hills on the trails, the climate offers some respite from the heat. Overnight (independant riding out of tour times) hire with half or full day guided tour £300. Solo motorcycle daily hire Honda Grom 125 £100 per day. Longer hire periods by arrangement with discounted rates, please ask with your requirements. All vehicles insured. Fuel at your own expense. All vehicles come with a full tank of fuel. Organised Food: Konoba meal: £15 each with a drink. Traditional grill as our guests: £10 each with beer / wine. If you prefer to organise your own accomodation or food, we can give you advice. Booking.com and AirBnB offer many apartments in Karin. 7 day holiday for 2 people sharing a sidecar outfit. Vehicle Damage: There is no deposit to be paid for hire or use, but any damage caused will be chargeable and payable prior to leaving. Sidecars are difficult to drop, so you should be ok! Currency here is the Croatian Kuna, about 8.1 to the Pound, (Brexit shenanigans may change this!). There are plenty of cashpoints around, most konabas take cards, cafe bars usually prefer cash. Please feel free to ask any questions that you might have, I am here to help! If you would like to make a booking, please email us . Please like our FB page, 3 Wheels Better for information, photos and updates on our sidecar adventures here in beautiful Croatia.